The Victoria Show had a small hiatus so we were thrilled to be back in Victoria after a 2 year gap. 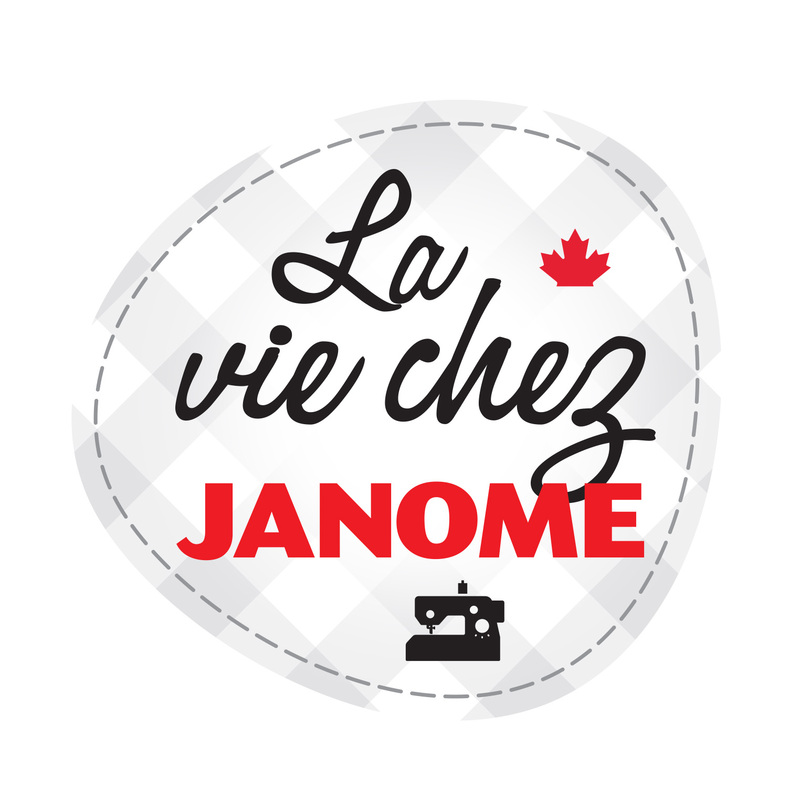 Good to be able to “catch up” with Vancouver Island customers, chat to sewing friends, offer sewing advice, see exciting new projects, shop for all things sewing & more under one roof, and…….did I say it: have fun! 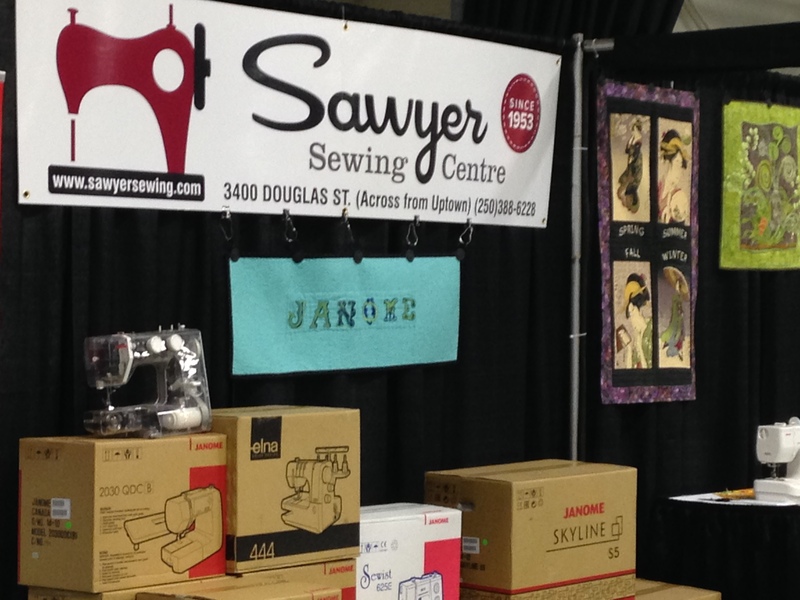 This time around the Sawyers Sewing Center Janome booth hosted something NEW: Jarret from Sawyer Sewing Center in Victoria and Kathy & Donna from Snip & Stitch Sewing Center in Nanaimo teamed up to offer ongoing demo’s on our Embroidery software products AND our brand new Artistic Edge 15 Digital cutter which is SO exciting with all its limitless possibilities for sewers, embroiderers, crafters, scrapbookers, card makers, home decorators and more. Donna (left) and Kathy (centre) from Snip and Stitch Nanaimo discussing the Artistic Edge 15 digital cutter with a customer. 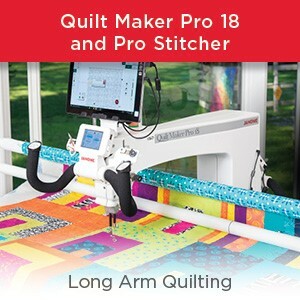 Donna did ongoing demo’s with our fabulous new digital cutter plus the software which comes with the cutter – all right there on a TV screen for customers to take full advantage of Donna’s expertise. 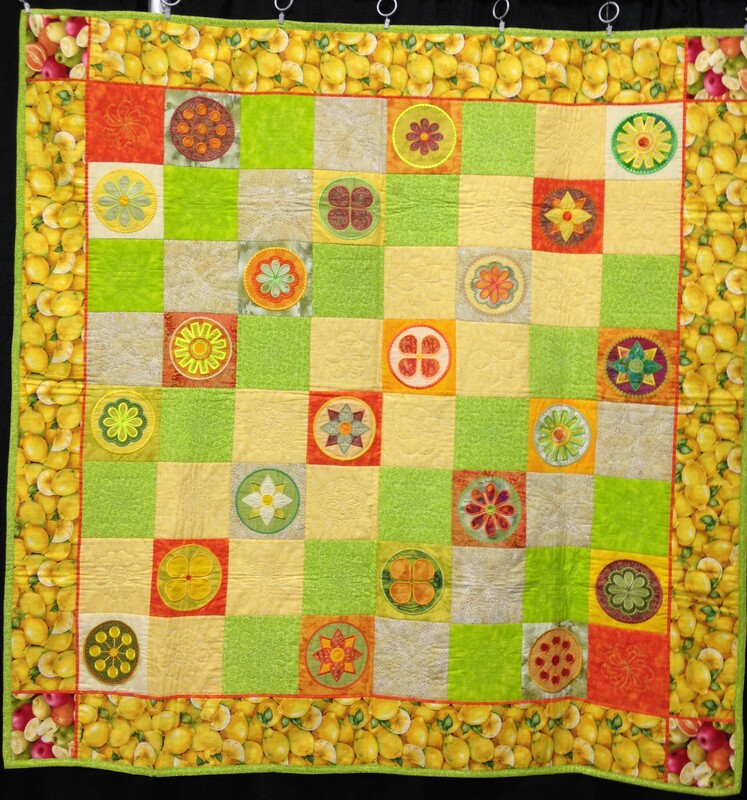 Donna’s lovely SPRING project – all applique shapes were cut using the Digital cutter and all stitching was digitized using Artistic software and then stitched in our amazing Janome MC15000. Donna was showing customers just how easy it is to use the SIMPLE CUT software which comes included with the cutter to cut the fabric…..NO MORE fiddly cutting with scissors! We love this. 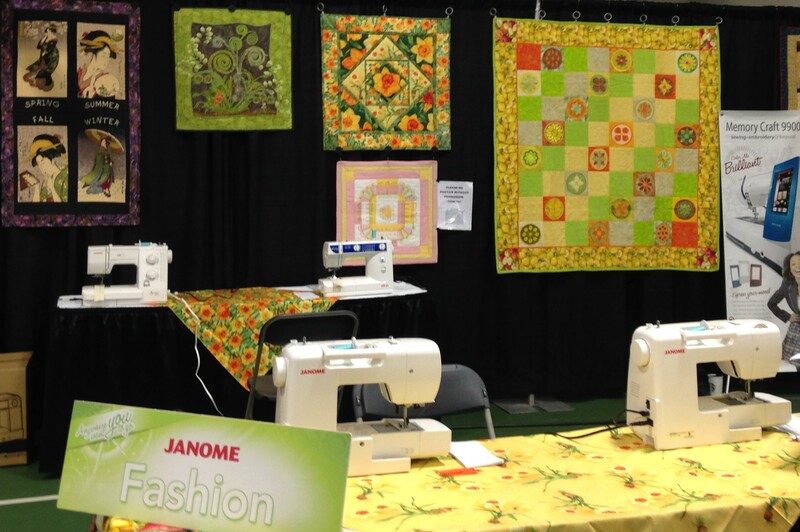 We also decorated the booth with lovely cheerful spring colours with lots of quilts, table runners as eye candy for folk to look at, take pics if they wished & ask questions about techniques used on the various projects. 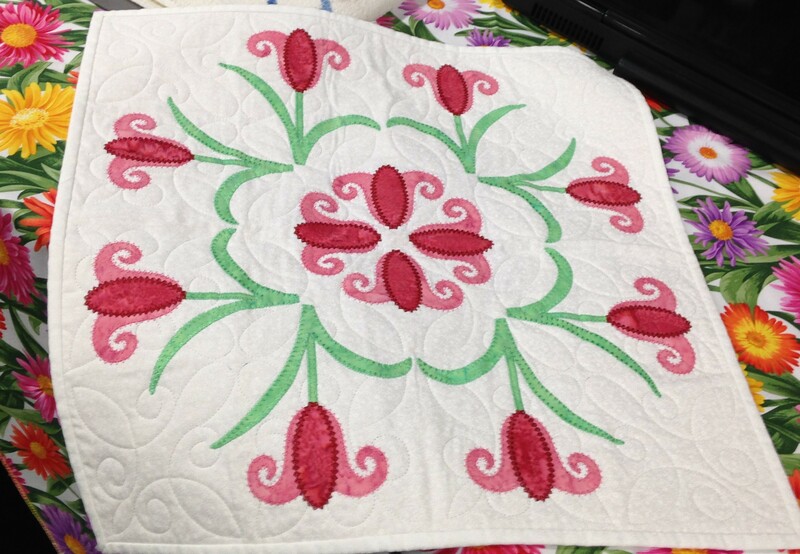 The 2 classes I taught were very well attended and I sure know I had fun sharing around 35 tips for Serging with knits plus showing more than 6 Quick & easy gift ideas to sew in the other class. 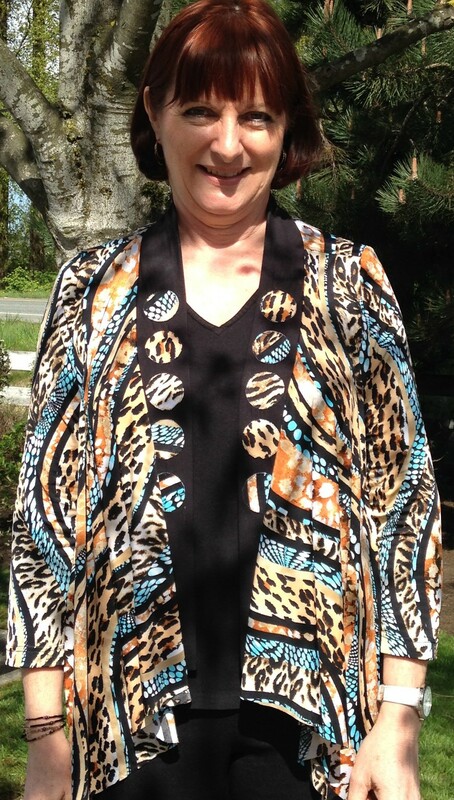 One of my very favourite jackets made with very soft drapey ITY knit fabric…..we discussed at length in my serger class how to sew fabrics like this. Weren’t in Victoria for these classes? I will be repeating them in Abbotsford on 27th & 28th March…..see you there? 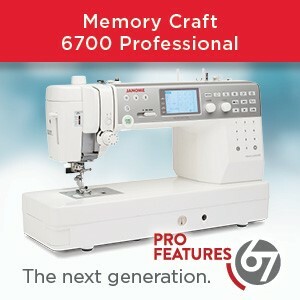 There might be a few spots left in those classes? 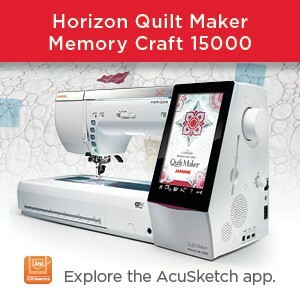 This entry was posted in Applique, Creativity, Decorative stitches, Digitizing, Fashion, GARMENT SEWING WITH JANOME, Janome 1100D, Janome Canada Sponsored, Janome Embroidery, JANOME EMBROIDERY SOFTWARE, Janome Fun, JANOME PROJECT IDEA, Janome Quilt, JANOME SERGERS, Janome Sewing Machine, Janome Sewing Machines, learn to sew, Scrapbooking, Serger, Sewing, Sewing Project and tagged ARTISTIC EDGE 15 DIGITAL CUTTER, Janome Embroidery software, QUICK & EASY GIFTS TO SEW, SAWYERS SEWING CENTER IN VICTORIA BC, SERGING WITH KNITS, SNIP AND STITCH NANAIMO BC, VICTORIA SEWING SHOW 2015. Bookmark the permalink.